Let’s say you’re sitting on your couch, playing a new hit game. Borderlands 2 makes a good example. So there you are stalking the dystopian wastes of Pandora, when you come across an angry psychotic bandit wielding a gun that fires bullets literally made of fire. Normally when shot by such a weapon in Borderlands 2 your character will make an audible indication of distress, your screen will shake a bit and your controller might vibrate. However, a newly-published Sony patent may change all of that. Officially dubbed the “Temperature Feedback Motion Controller,” this new design would allow those special wands used in conjunction with the PlayStation 3’s motion-controlled Move system to rapidly heat up or cool down on demand. Assuming Sony pushes this idea into mass production this could allow developers to add tempeture-based feedback to their titles. Instead of the standard grunts and tremors of our above example — which, yes, we realize is a bit poor given that Borderlands 2 doesn’t have Move functionality — future games might be able to directly simulate those flaming bullets by rapidly heating the controller the player is holding, possibly to the point of causing actual pain. All of the in-depth technical info on this idea can be found in this official patent application, published yesterday by Sony and specifically credited to inventor Anton Mikhailov. Though Mikhailov’s name may not be immediately familiar to the average gamer, he’s most famous as one of they key software engineers behind Sony’s Move technology. In fact, if you watched any of the tech demo videos Sony published prior to the official public release of Move in 2010 (this one for instance) odds are pretty solid that it was Mikhailov featured in the clip demonstrating the device. He also had a hand in Sony’s Move predecessor, the EyeToy system, as you can see in this demonstration of that technology. Of course, you’re not here to hear about Mikhailov. 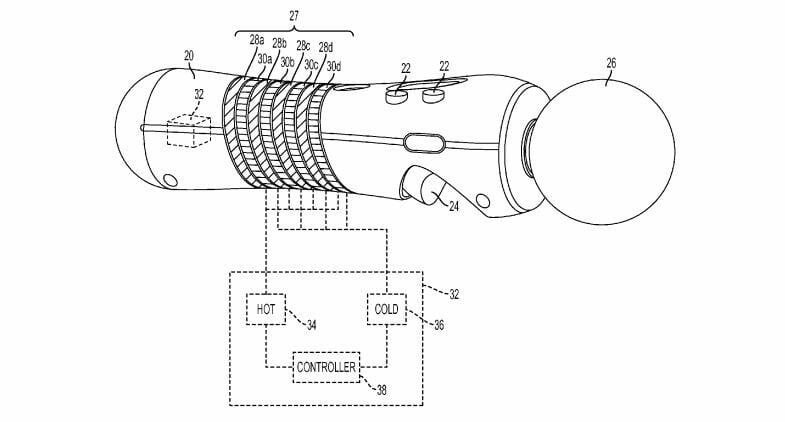 Instead, you want more info on this still-hypothetical, temperature-based addition to Sony’s motion-control technology. While reprinting the in-depth details covered in the patent would be far too verbose for this article, the patent application’s abstract does an excellent job of explaining the device’s functionality, as well as its stated purpose. Though the patent is, as one would expect, heavy on all the technical info that would go into making a system like this work, it lacks any indication of how far Sony is willing to take this concept. When reading the patent’s initial description, how many of you imagined Move controllers capable of sending painful burning sensations through the hands of users who are playing poorly? That’s not a novel idea — fans of the James Bond films will no doubt recall a scene in 1983’s Never Say Never Again in which the super spy is forced to play a version of Pong dubbed the “Painstation” that rewarded poor play with various painful stimuli — but it’s never been used in a mainstream video game system. On the other hand, there’s probably not much profit potential in wounding users, so this patent likely won’t lead to a future in which your PlayStation leaves your hands blistered and smoking. It seems that we’ll just have to wait to see how/if Sony leverages this technology in its future plans.